In our highly wireless world, interference is an unwelcome addition to the equation that results in noise, interrupts cell phone calls and just generally messes up communication. In the case of cellular networks, interference is actually part of the network. While more networks today have built-in features to detect interference, these tools often lack context as they are geared towards only a few types of signals and may only be able to measure the impact of the problem over a single channel. A spectrum analyzer is the trusted tool that engineers use to measure and identify sources of interference. There are many types of spectrum analyzers on the market, but many people opt for small battery-powered spectrum analyzer models because they need to be able to move around freely and correlate data from multiple locations. When on the hunt for interference, the first challenge is to determine if it’s even possible to measure the interfering signal. Typically, a victim receiver, which is the first place to look, is easy to identify. The challenge is that radio receivers are able to detect very small signals. Therefore, the spectrum analyzer must be set up to closely mimic the sensitivity of the victim receiver to “see” what the receiver is “seeing.” For example, an average LTE receiver has a sensitivity in the area of -120 dBm. This means that any RF pollution on the receiver channel that is greater than -120 dBm can affect the operation of the receiver. There are two controls in the spectrum analyzer to adjust sensitivity: reference level (RefLvl) and resolution bandwidth (RBW). The challenge is that when taking measurements “over the air” (OTA), the reference level needs to be kept fairly high (-30 dBm), so that the spectrum analyzer doesn’t become overloaded with all of the RF energy being measured. In most spectrum analyzers, the RBW control is set automatically based on the frequency span that the user has configured. In OTA measurements, RBW values should be reduced in order to see small signals that could be affecting the victim receiver. This combination results in a very slow sweep rate for most battery-powered spectrum analyzers, which means that it’s almost impossible to see intermittent low-level transient signals that are causing the interference. 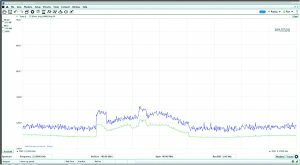 Real-time spectrum analyzers address this shortcoming by being able to measure the spectrum with a narrower RBW filter, faster than basic sweeping spectrum analyzers. Figure 1 shows an example of what a LTE signal looks like OTA. 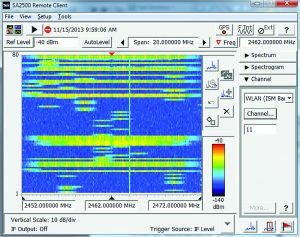 In this case, the span is set to 40 MHz, which results in a default RBW of 300 kHz. Note that determining the emission in the center of the display is quite difficult. If there was a narrowband (< 300 kHz) interferer it would be almost impossible to see it with this setup. Figure 2 shows the same setup using a 1 kHz RBW filter. In this case, it’s clear that the LTE channel and the effective sweep time has only increased to 40 msec. 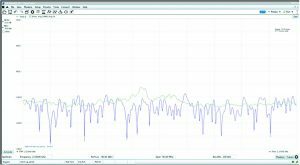 This is one of the first benefits of using a real-time spectrum analyzer (RTSA) to measure interference on the radio channel. Once expensive and desk-bound, a new class of affordable, battery-powered, USB-based real-time spectrum analyzers are now becoming available on the market, making RTSA a practical choice for interference-hunting applications. Traditionally, the various trace modes available in a spectrum analyzer are used to help characterize RF signals of interest. Peak hold, average and minimum hold are common. Even when employing these trace modes, it is still difficult to determine how often a signal is occurring or if one signal is somehow related to other signals in the same span. RTSAs provide a solution to this problem: a fast spectrum display with persistence effects. Remember that in a real-time spectrum analyzer, for any span up to the maximum real-time span, the instrument is not sweeping, which means it is capable of measuring the spectrum tens of thousands of times per second. But the spectrum cannot be displayed that fast. To solve that problem, spectrum analyzers with persistent displays were developed, as shown in Figure 3. A persistence display (or digital phosphor display) keeps track—pixel by pixel—of how often energy is being measured. The color of the pixel indicates how often a signal is present. With temperature scaling, red means a signal is on often while blue means it’s on less often. With the combination of fast spectrum measurements and persistence, infrequent events can be more easily identified. When operating with a real-time display, it’s important to take care when selecting the RBW filter. Just like in a regular spectrum display, the RBW filter selection will greatly affect the speed of the spectrum measurements. One of the key specifications for an RTSA is the probability of intercept (POI). This specification dictates the minimum signal duration that the instrument is guaranteed to detect. Selecting a narrow RBW will change the POI for the measurement—an important factor to be aware of. While a much greater amount of information can be obtained from the persistent display compared to a basic spectrum display, it doesn’t reveal the whole story. In modern radios there are many protocols that employ some form of clear channel assessment. Essentially, such radios are capable of determining how busy a channel is and will only transmit when no one else is using the frequency. Even a fast persistent display cannot show the timing relationships between two signals. To determine the timing of signals, we need to use the spectrogram function, as shown in Figure 4, which allows us to plot the spectrum data over time to determine how often signals are active. Spectrograms are a type of waterfall display that plots the spectrum activity over time. As in a typical spectrum display, the start frequency is on the left-hand side and the stop frequency is on the right-hand side. Time is the on Y-axis and color indicates signal amplitude—red being the highest amplitude and black being the lowest. The spectrogram is composed of the peak detected data from the persistence display, and the amount of spectrum data aggregated is defined by the user. With these controls, the user can record the data for long periods of time (hours) and then export and share the results. This is especially useful when there is a stubborn interference problem and the spectrum needs to be monitored for a long time. In the event that you are dealing with an intermodulation issue, the spectrogram can help determine the fundamental elements of the mix. Keep in mind that with RTSAs the spectrum information is instantaneously measured for the entire time span. This means that we can use the data to perform a visual carrier correlation to confirm the timing relationships between source carriers and intermodulation products. Interference is a meddlesome guest in our wireless world that will never leave. The best solution to this thorny problem is to become good hunters with real-time spectrum analyzers whose displays are up to the task of pinpointing and displaying interfering signals no matter how elusive. Robin Jackman is a field applications engineer based in Toronto, Ontario. He has been with Tektronix for more than 15 years, supporting customer applications throughout North America. His work with Tektronix has covered both analog and digital design with a focus on RF applications. Prior to Tektronix, he spent 12 years working for the federal government in spectrum management.